Last week I reviewed Room 1015's Power Ballad, a fragrance inspired by memories of teenage love and rock clubs in the 1990s. I didn't think it succeeded as an evocation of that decade, and many of you agreed with me. Ironically, although you (we) might have been listening to grunge or wearing Doc Martens and oversized flannel shirts in those days, there's a good chance you were wearing a clean- and fresh-smelling fragrance. It might have been a body spray picked up at Bath & Body Works, or it might have been a splurge from a department store. (I personally went through several bottles of Kenzo Parfum d'Été.) It might have been Issey Miyake L'Eau d'Issey. In 1992, Issey Miyake was already known for his sculptural-minimal designs, which reinterpreted traditional Japanese techniques of fabric-wrapping and origami in state-of-the-art synthetics and other unexpected materials. For his first fragrance, he collaborated with the perfumer Jacques Cavallier. Miyake reportedly said, "Surely the scent of a woman who's splashing water on her clean body is the most beautiful fragrance in the world,"1 and this directive resulted in one of the era's most successful aquatic-ozonic scents. The new aromachemical Calone had been starting to appear in fragrances like 1991's Calvin Klein Escape, but it really took on a starring role in L'Eau d'Issey. Just when I start to think that L'Eau d'Issey's watermelon breeze and I don't get along, the fragrance's heart blooms in translucent white floral notes, especially some very clean freesia and a lily with just a hint of saltiness. There's a sharp, stemmy green note running throughout, and the base is a mix of sheer, well-scrubbed wood (almost cedar-ish) and musk. 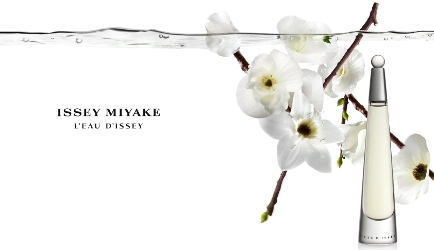 Despite all its "light" and "fresh" notes, L'Eau d'Issey is surprisingly tenacious on skin. At the end of a full workday, I could smell it on my wrists. It had come full circle to its dewy melon-rind introduction again. 1. Michael Edwards, Perfume Legends: French Feminine Fragrances (1996), p. 276. I went through bottles of this, after it just came out. It has changed though, over the years. What hasn’t. It may have been a whole lot fresher than your typical eighties fragrances, but I still find it very loud. I remember it as sweeter, and with more fruit. I worked in hospitals at that point in my life, and it was probably quite a welcome antidote to the smells there. I gave my last bottle of it away to a friend, who enjoyed it to the last drop. Long after I had ceased enjoying it. It’s great to read a review of it, it usually just gets pushed aside. So a big thank you! I was reading up for a perfume history/culture class I was about to teach, and I suddenly wanted to revisit this one! I always think of CKOne as a 90s essential, but L’Eau d’Issey really had its heyday, too. I’m glad it’s still around, even though it’s changed a bit and it was never quite my stile. I was born in 1990 so I don’t know that I’ve ever smelled it. Certainly not knowledgeably. That’s how I feel about the original Romeo Gigli fragrance!! I tried L’Eau d’Issey again at the duty-free in Newark just for laughs last year. I had a thin, pale, watery fragrance in my memory, but I was surprised at how floral it was. Not exactly natural-smelling, but I kind of…..liked it. Yes! I remember it being really transparent and watery — but it has more fruit and flowers than I recalled. I guess it just seemed minimalist in comparison to Obsession or other heavy-hitters of the late 1980s! I am wearing this today. I used to wear it years ago and kinda forgot about. It’s so clean and summery, I still get many compliments on it. It’s one of those fragrances, like White Linen, that just feel good in hotter weather! I keep meaning to revisit this one, so thank you for the nudge! I still think Kenzo has done some of the best bottles, too. I do like the Miyake bottles, in general. This one is so 1990s but still looks good, I think! and the Kenzo bottles were/are also really sculptural and interesting. It’s brave of you to review this, the fragrance that defines a genre that so many perfume enthusiasts detest. I can’t stand L’Eau d’Issey and was amazed when it came out that anyone could contemplate wearing such a thing (but I had just bought a bottle of Paloma Picasso, so that says a lot about my taste!). But I bought and loved Pleasures when it was released in 1995; also a big clean fragrance but without that ghastly calone. The 90s was quite a diverse decade fragrance-wise, seems to me. Yes there was a lot of L’Eau d’Issey and CK One, worn especially by young people who would not dream of wearing the nostril busters of the 80s so beloved of their mothers. But the 90s also brought us White Diamonds, Tresor, Amarige, Spellbound, Allure … all those big and fruity florals. And they sold in big numbers. So it seems to me that in the 90s the market for fragrance must actually have expanded … more people must have been wearing fragrance than before. Funny that you mentioned Amarige — I remember going to the mall one day in the mid-90s with a craving for a new perfume. The SA was pushing Amarige, but Kenzo Parfum d’Ete was more my style at the time. A friend of mine did wear Amarige later in the 90s, and it smelled great on her. Then I moved into fruity-sweet perfumes like The Body Shop Alanya and the original Betsey Johnson scent and, by the end of the decade, the original Jean-Paul Gaultier fragrance! So, yes, there were a few categories to choose from as well as the spanking-new clean-and-fresh Calone category! Good on you for sticking to your own taste! I never wore Amarige back in the day but I wear it now. Luca Turin took a swipe at it again the other day on his blog. I wish he would leave the poor thing be. I wore L’Eau d’Issey at a time when I also wore Paris YSL and the original Nina by Nina Ricci. I think I liked to keep things varied, even then. Wasn’t that the original Kenzo? It’s called Ça sent beau today. I never had that, but always admired it on others. The ads for that one were so sweet! The only perfume I rember wearing in the 90s was Exclamation, and I think that may have been the earlier part of the decade when I was in middle school. I don’t remember wearing perfume in high school but my main scent memory of the time is this very loudly apple scented lotion from Bath & Body Works that every girl but me seemed to have. I hated that stuff. I didn’t even smell L’eau d’Issey until relatively recently, and at that only on a test strip. I didn’t like it but your review is almost making me think I want to revisit. I loved the bottle for Exclamation! Good inexpensive fun. There were some cute drugstore fragrances in those days. And yep, some of those B&BW lotions and body sprays were/are *very* strongly fragranced…the teen-girl version of AXE. In 1998 I went looking for a perfume for my wedding. I remember the SA telling me that this was their best selling wedding scent. I really, really didn’t like it. I wanted something big and different. I smelled it again the other day, It still isn’t for me, but I can appreciate it now. Thanks for the review.